If you’ve never made homemade candles, I sincerely urge you to try it. I was always afraid to give it a go, but finally stepped out of my comfort zone a little over a year ago and wondered why I had waited so long! I think the idea of melting wax freaked me out (you know, horror stories in the kitchen) so I just kept buying candles at the store. 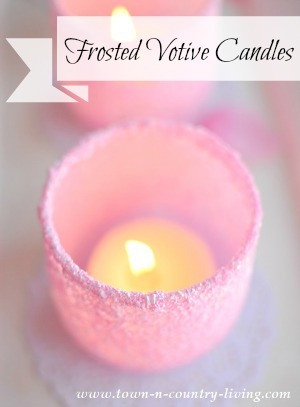 Today I’m sharing how to make scented candles so you can see just how easy it is. Of all the candles I’ve made, I think this batch is my favorite. I kept them simple and let the beauty of the jar take center stage. 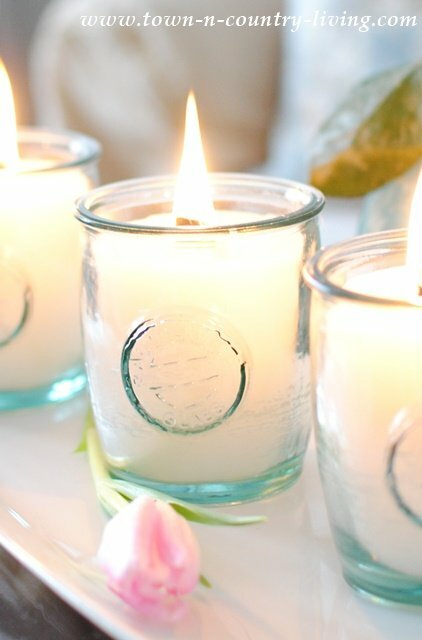 I found these Authentic Recycled Glass jars at Home Goods and instantly knew I wanted to make candles out of them. These glasses would be cute as tumblers too, with their slight aqua hue. Maybe after the candle’s done burning, I’ll sterilize them and keep them for drinking … or I could make more candles from them. I did do one thing different with this batch of candles. I used wood wicks. I recently bought a wood wick candle and liked it so thought I’d try them out. One advantage of using wood wicks is that they stay straight up in the jar when pouring the melted wax. You simply insert the wood wicks into the metal tabs provided. You can then hot glue the metal tab to the bottom of the jar so that the wood wick stays in place when adding the melted wax to the jar. With a regular wick, you have to wrap the top end around a stick to keep it in place. Once your wicks are set and the jars are ready, you melt the candle wax. You can buy candle kits that have a metal pitcher, but I like using an over-sized glass measuring cup. You can easily see through it to keep an eye on the wax. The metal ones, you have to stick your head over it to see inside and all the steam comes up from the water and melts your mascara. Not a good look. You can buy candle wax in large chunks or in chips. I ended up cutting the large chunk into smaller pieces to speed the melting process. 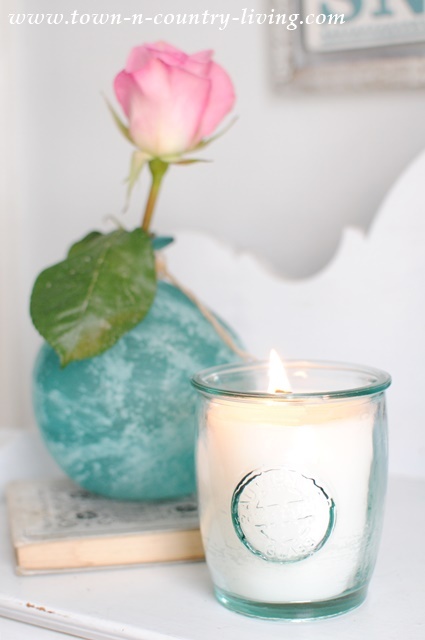 I used paraffin wax but you could opt for soy wax which burns slower and cleaner … it’s also more expensive. When the wax reaches 200 degrees Fahrenheit, you can turn off the heat and add your liquid fragrance. I used 1.5 ounces for 4 pounds of wax. 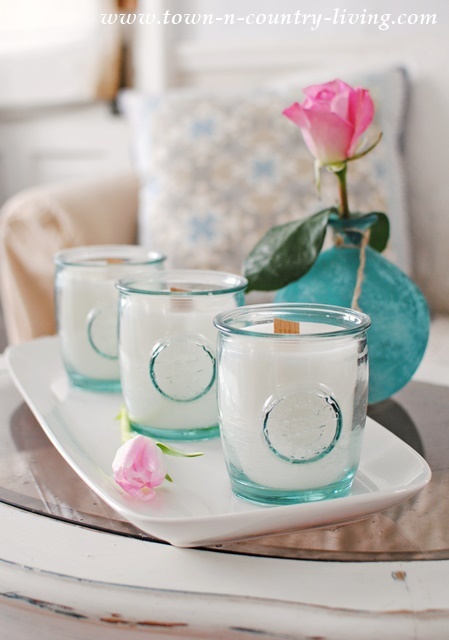 You’ll find the fragrances in the candle making section of your local craft store. For this batch of scented candles, I mixed 1 ounce of cinnamon fragrance with half an ounce of maple fragrance for a blended scent. If you want to dye your candles, you can add the dye at this time. I opted to leave mine white. After you mix the fragrance into the melted wax, you’re ready to pour your candles. 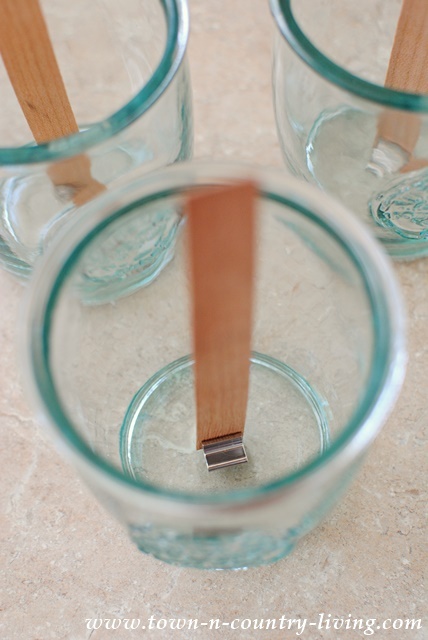 Work carefully and pour the melted wax up to about an inch lower than the rim of your glass. 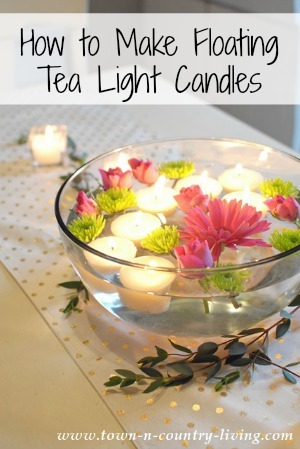 Make sure to save some of the wax to top off the cooled candles. Allow the wax to cool and solidify. You’ll notice the wax sags at the top close to the wick. 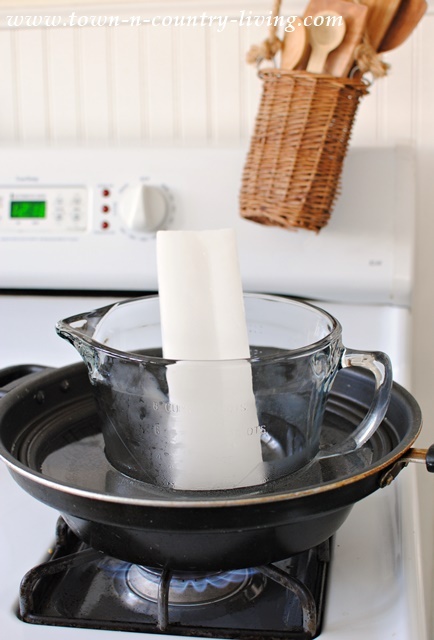 Reheat the remaining wax and top off the candle to fill the sagging hole. Then let the candles cool overnight and trim the wicks about one-fourth inch above the wax line before lighting them. I’m glad I decided to leave these candles white. Normally a cinnamon maple scented candle would be tinted a rusty fall color, but who says you have to follow typical conventions? 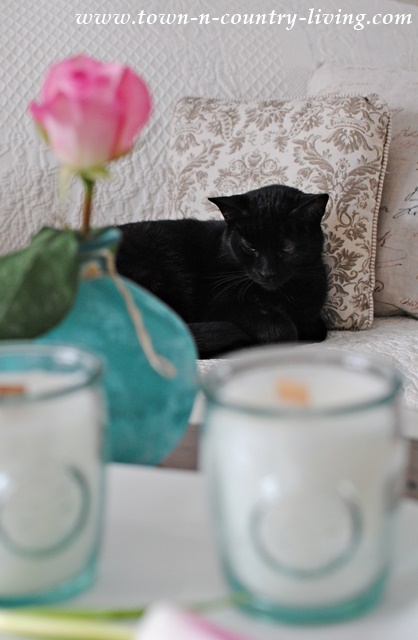 Felix is a little annoyed that I interrupted his cat nap by arranging the candles nearby. 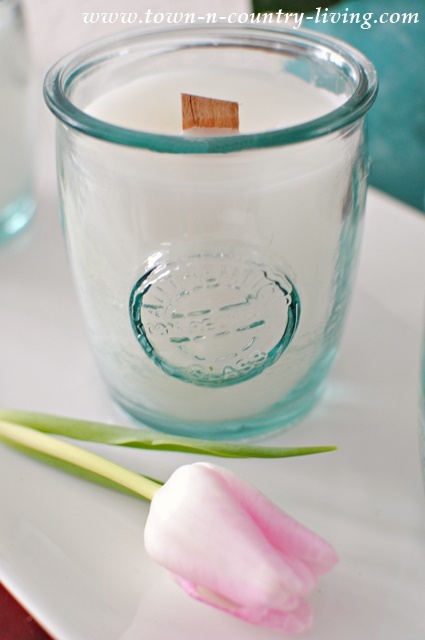 And that’s how to make scented candles in a jar! I do hope you give it a try. Just follow the instructions included with the candle wax you purchase. Hubby says I should make more candles and sell them, but that would require keeping up a regular candle-making schedule and could take all the fun out of it. Besides, it’s more fun to give them as gifts or enjoy them in our home. 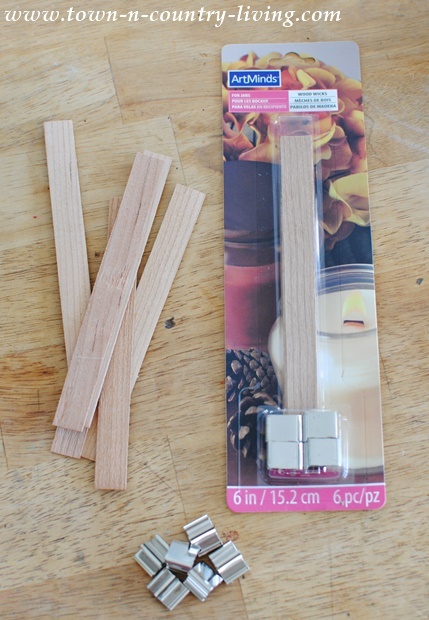 Very interesting I used to make my own candles and have never heard of wooden wicks. Hi Jennifer, you have inspired me to try these candles. I love candles but find them quite expensive for the good ones. I do have one question, to reach the correct temperature is there a special thermometer for wax? Thanks again and I love your blog! Hi Shirley-Ann! Yes, you can get a special thermometer for candle wax. Check your local craft store or you can find them on Amazon too: http://amzn.to/1PH1fgB. Hope you had a Merry Christmas and Happy New Year to you as well. I think that I was like you fearing what would happen in the kitchen if I endeavored to make my own candles. I love the little jars. I love to have candles burning around the holidays or any time. Candles is jars are great. I usually have tea lights going but they do no last very long. I will have to give this a try. I am going to scour second hand places and my local Salvation army to see if I can find some nice little glass jars or votive holders to do the job. I found out that there is a Micheal’s craft store not too far away. I will have to make a trip there soon to get everything I need. Thank you for the inspiration. What beautiful candles! Love those containers…so very pretty! 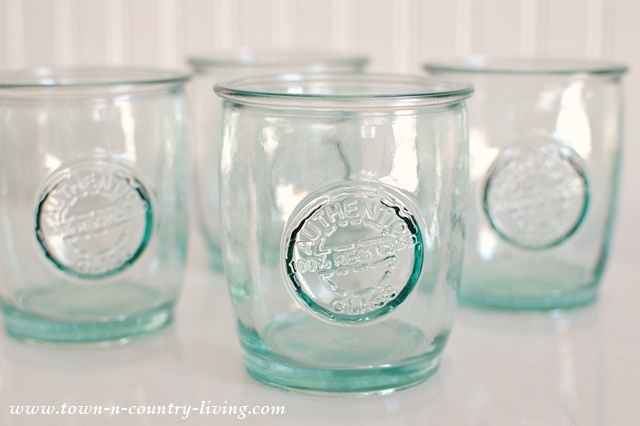 Great how-to guide, Jennifer, and I love the glass jars you’ve selected!! Also love that pic of Felix 🙂 I’ve seen wicks made out of bamboo before, and I think they’re a great alternative to regular wicks. The maple-cinnamon fragrance sounds scrumptious! 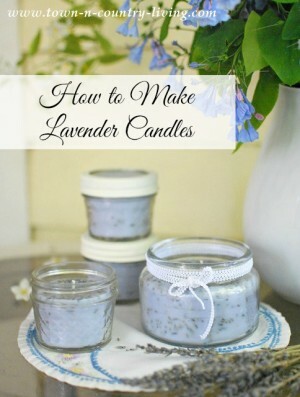 Yum…Hoping to give candle making a whirl this winter when things are a little quieter on the home front. Happy New Year and happy candle making, too! I’m crazy about candles. Jennifer thanks for your innovative idea. I’m glad that I found your post. Hey Patricia, I’m crazy too! Lovely black cat! Like this photo.